LONDON, Aug 28: Britain’s most senior Muslim policeman launched a stinging attack on Thursday on the controversial head of London’s police, against whom he has launched a discrimination claim. 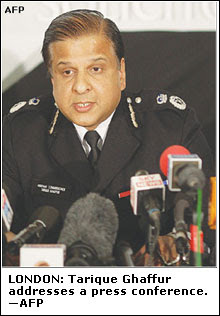 Assistant Commissioner Tarique Ghaffur said it was with “deep regret” that he was taking Sir Ian Blair of the Metropolitan Police to an employment tribunal and denied the move was linked to unhappiness at not being promoted. “My current case is essentially to do with my treatment at the highest levels of the Met, in particular the discrimination I have been subjected to over a long period by the present Commissioner Sir Ian Blair,” Ghaffur said. He added it also covered treatment he had faced in his current role as security coordinator for the London 2012 Olympic Games. Sitting alongside his client at a news conference in London, Ghaffur’s lawyer Shahrokh Mireskandari suggested that his case might not be an isolated one.